Spectro Kids Intense Rehydration Moisturizer is specifically formulated to replenish your skin's natural moisture barrier and protect from environmental stressors that cause dry skin. This gentle, irritant-free formula is ideal for sensitive skin. This soothing formula relieves itching and reduces redness due to dry, cracked skin. Accepted by the Eczema Society of Canada. It works well for my grandson â€˜s dry and eczema problems skin. My LO has been using this cream since 6 month old. It really works for dry sky n and eczema problem. It is my 3 year old grandson â€˜s favorite moisturizer for his skin ( eczema) problem . He has been using it since 9 month old. This is an excellent product! My 7m old baby has been suffering from baby eczema for quite some time and nothing helps to keeps her skin stay moist like this product does! Her skin improved a lot the 3rd day I used the cream on her, now I only have to apply it 2 times a day on her and thatâ€™s enough to keep her skin stay moist and soft all day! This is my 3 year old grandson's favorite brand of moisturizer. This is the only cream that works on my babies eczema. So have tried others in similar and higher price points and this is the best. Its thick yet feels silky when applying and leaves zero residue on the skin. Iâ€™ve been using this cream for about a year now on my son. He has very sensitive and dry skin. This cream works the best! Itâ€™s scent free and helps keeps his skin moisturized without irritating it. My baby has been using this cream since birth, she never had any skin issues. I like the product because it is scent-free. However, this cream is very thick and a bit hard to spread. My almost one year old gets chapped, red cheeks in the cold weather. They used to stay red for days, but a little bit of this cream clears it up overnight. Haven't been using it long, but so far so good. Love! Keeps my daughters usually dry cheeks very hydrated in the cold weather! This is the only cream I have used for my infant/toddlers skin issues. It's the best. Works well to hydrate dry skin, including on the face. Don't love the tube it comes in though, as it's hard to get all the lotion out and it cracked from being bent repeatedly to squeeze it lotion. I would highly recommend!!! My children have all dealt with eczema and this cream seems to clear up most spots within a night or two. I usually apply it right after bath time. It also works well on their cheeks which seem to get so dry each winter. It is quite thick but it melts and absorbs easily so you really don't need much. This gentle cream has helped out my 6 month old's dry skin and rosacea on his face and hands. As much as I want to love this product, it does not work. This product irritates my baby's skin and it does not hydrate the skin. My friend recommended this cream. Very good cream for dryness. I've tried many different creams for my lo since she was born, she used to have dried skin problems and eczema, especially when she's teething there was rash around her mouth which made me feel really bad. This cream solved all the skin problem, no more dry skin or rash or eczema. Even myself use the cream sometimes. The only thing I dont like about the cream is the package that makes it too difficult to use the last bit in the tube. But overall it's our favourite cream and I'm giving it 5 stars. Great product! My son has struggled with eczema since he was born. This product was the first that really help soothe and heal his dry spots. It's very gentle and he doesn't complain about any burning feeling like he has done with other eczema products. Highly recommended! I've been very happy with this product so far. My 1 1/2 year old son seems to hate all creams being put on his eczema skin, I think because it stings, but he will tolerate this one more than the others. He still doesn't like me touching the skin, but doesn't cry afterwards as with others. I also found that since I can get it on his face and neck better (as he doesn't complain as much), it is doing a very good job at clearing up the eczema better than anything I've used. My daughter has extreme eczema and is allergic to all types of creams. I tried this one and within 24 hours, her eczema was cleared up and hasn't come back. I've used this cream once and her skin is smoother than it was when she was born!!! This cream also worked on my brother who is allergic to everything and needs cortisone cream after every shower. One use of this cream and his skin cleared up. Don't love the smell, but after trying a ton of other creams, lotions, and oils for my daughters dry skin, and this was the only thing that worked! Cleared it up in a couple days! This cream is working well to prevent breakouts of eczema for my 6 month old baby. With this product, I am able to bathe her daily and still keep eczema away. Not greasy and absorbs well into skin. The only downside, is that it does have a medical scent to it. This did not work for my one year olds eczema. I've been using Lush dream cream for a while now, it's worked better than anything but thought I would give this a try because it's cheaper and my doctor recommended it. I don't like the smell, it's not awful but it's strange and it didn't help with itching at all. My daughter had horrible eczema and this cream cleared it up! None of the other creams I tried helped. It is very thick - so apply sparingly. This moisturizer was recommended by our pediatrician and works wonder for my twin babies' skin problems. One of them has eczema and the other had scaly cheeks in winter. The moisturizer took care of the scaly cheeks in just one application, it's the only one product that works. For the baby with eczema, the moisturizer helped relieve his itchiness. I've tried many other brands, even the ones without fragrance, but they only irritate their skin even more. I use this moisturizer with the Spectro Kids E-Care body wash, a great combination. This cream has a strange chemical scent and its expensive. Although it initially worked well on my daughter's eczema it became less effective as time went on. Like so many other creams it has only helped for a short while. I hoped this would be the miracle cream it's made out to be in other reviews. Back to the drawing board...again! Very moisturizing, but a little hard to spread. I sometimes put some baby oil (burt's bees is a good one) or vaseline on top to seal the moisture. This is a great product for those looking for something to both prevent and treat dry skin, mild eczema or small psoriasis spots. We use it right out of the tub, on damp skin, every other day for prevention, and every day during flares. It does have a medicine-ish smell, but that soon fades, and I like that it doesn't contain steroids. Non-stinging and soothing to apply. Definitely recommended! I don''t like this product. It has a very strange medicinal scent. Works really effectively on my son - using it for 2.5 years. Almost as good as prescription for eczema. Great alternative to steroids when you really don't need something that strong. Only use it on flare-ups and a tube has lasted a long time. You don't need to lay it on thick. I use this as an adult after reading some reviews. It works well, removes itching but doesn't do much for the red splotches of eczema. I would use this product again after trying a few more. So far it has been working very well for my 15 month old. He has had very dry skin since he was introduced to solids. It was soft after the first use. I use it ever other day. A little goes a long way. Just bought this cream a few days ago and I've already seen a difference in my 2 year olds skin. We've been battling eczema since birth. I will be buying this product again. So worth the cost! I use this for myself, an adult, because it is the only thing that really works. We LOVE this product. We have been using it on our now 7 year old since she was a baby. It is the only cream that has worked for her, and we have tried many including prescription. This is a great product which I love for my daughter who has sensitive skin. It really makes her eczema go away. I would recommend this product to anyone who has eczema! My 4 month old daughter has sensitive skin, she has eczema on her face and arms and this product works great for her! recommended this product especially for your baby's dry skin and eczema. love this for my son. He has very sensitive skin and this is the only thing that doesnt hurt him and it works great!!! Love this product!! My 9month old son has/had horrible eczema , so I used this cream every night along with the body wash (which is impossible to find now, would be great if you guys carried it though) and its kept the eczema away! This was my first time buying this product. My Doctor recommended it for my 3 month old's very dry scaly skin on her face and knees. After just a few days, her skin cleared right up and is now baby soft again! I searched in several big name drugstores around town for this cream and it was very hard to find - but Well.ca had it in stock, at a better price and it was delivered right to my door! This was my first time buying this cream, and it really seems to be doing wonders for my 2 year old's very dry, scaly skin on her face! We've been using it every evening and I do notice a big difference! I will be buying it again. Two of my sons have eczema. I spent a fortune looking for creams and lotions to soothe and control their itchy skin. Spectro for kids is it!! it is all I ever buy now. 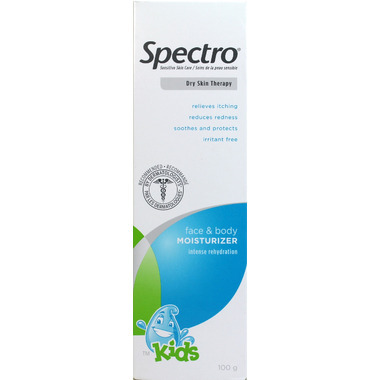 One use almost heals the skin and at the first sign of redness Spectro for kids stops it cold. Well.ca is cheaper than the drug store by about $4. Really, this is the only cream that helps with my daughter's eczema and prevents flare ups. I have tried many creams as well, and this one is by far the best.